By Nick Ostdick. Dec 17, 2015. 9:00 AM. When you think of a brewer, you don’t normally associate him or her with a sparkling literary career. But when you think of a brewer, you may not think of Brooklyn Brewery's brewmaster and author Garrett Oliver either. For Oliver, beer is something more than a fizzy, alcoholic beverage we pull from the back of the fridge after a hard day at the office, or something we guzzle on Sunday afternoons while watching our team battle it out against a rival opponent. 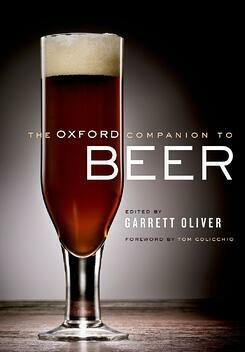 Beer is his life’s work and the subject of numerous essays, articles, and two highly-regarded books on the history and styles of beer, The Brewmaster’s Table, in 2003, as well as the uber-comprehensive, encyclopedic The Oxford Companion to Beer in 2011. A 2014 James Beard Foundation Award winner for his work in the beer, wine, and spirits industries, Oliver has forged a path all his own while simultaneously giving nod to the brewers, beer writers, and scholars who came before him. Oliver recently sat down with Books Tell You Why to talk about beer, beer writing, and what keeps him interested in telling the story of beer. Books Tell You Why: You’ve talked quite a bit in past interviews about how you fell in love with craft beer and brewing, so I don’t think we need to cover that in too much detail. But is it safe to say your journey to craft beer and discovering it as a passion inspired your first book, The Brewmaster’s Table? What made you believe there was a story about craft beer that needed to be told the way you told it? 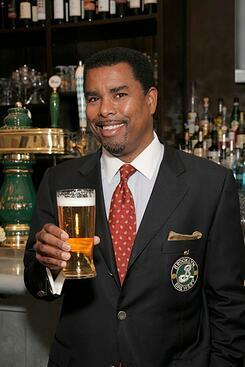 Garrett Oliver: Well, Brooklyn Brewery was originally a distributor of beer. When I started there, there were very few craft beers available in New York City, especially compared to other cities on the East Coast, some of which had much more vibrant beer scenes. I used to walk into a corner store or deli that sold 150 or 200 beers and watch people walk back and forth like they were browsing in a video store – you could tell they wanted something good, but they didn’t know what they wanted, and then they’d leave with a Heineken or something looking totally dejected. So as a distributor, the idea of a beer dinner was a great way to show off the various things we had. At the time, between Brooklyn and others, we had about 250 beers, all of which I came to know really well, and during these beer dinners we kept discovering wonderful pairings and combinations, which helped us realize how versatile and how well beer pairs with food. Once realizing that, it was like the idea was burning a hole in my pocket – I had something to say, something I wanted people to know. This was something I dedicated my life to and I wanted people to see it was more than just a beer in the glass. One thing I’m fond of saying is: You don’t find something new to like every day. Whole weeks can go by without finding something new to like. So it makes the days you fall in love with something - whether it’s a beer or pairing beer with a great dinner – pretty special. The Brewmaster’s Table was published in 2003. How do you feel the book has aged? Where did you see its place in 2003 and where do you see its place 12 years on? Funny enough, it sells better now than it did then, for the last five or six years, actually, and I think what’s helped is the way the craft beer scene has broadened and deepened. I mean, I used to walk through the brewery’s tasting room on a Friday night and have a good number of people say hi or hello, but they were all beer geeks. Now on a Friday night, the crowd is full of all kinds of people, not necessarily just beer geeks. Beer is now becoming good beer and becoming a better and bigger part of peoples’ regular lives. By and large, people have really good taste, and when they taste something really good – not something bland or terrible – they can tell. Most people, ten years ago when the book came out, hadn’t really been exposed to craft beer or beer that just tasted good. They hadn’t really tasted it yet. Was there a certain template for the book? 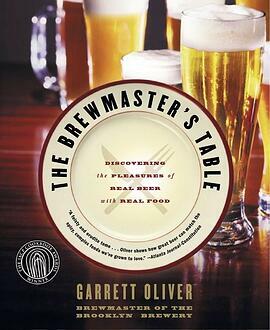 Were there beer books that came before The Brewmaster’s Table you were specifically looking to for inspiration? Not necessarily. If anything, I was trying to stay away from a lot of what came before, specifically what the great beer writer Michael Jackson had already done. However, the one big thing I certainly took from him was that the things people really want to know about and are interested in are not simply tasting notes. It’s about the people, the people behind the beer. One thing you automatically notice about The Brewmaster’s Table is that there are no small photos – they’re all full-page or half-page, and a great number of them are of the brewers themselves. No one had ever really published photos of brewers quite like that. People usually look at beer as if it came from a machine, whereas something like wine comes from the land. The point I wanted to make in writing the book the way I did was that beer is people. It’s a thing created by someone. It’s not just some a priori concept that shows up out of nowhere. Back in the day in a place like Brooklyn, there used to be something like 48 breweries. Everyone knew a brewer or folks who worked in breweries. They were public figures. And even though I might be a little bias, people who make beer are usually pretty interesting. Writing about something as personal an experience as taste and the memories associated with that moment seems pretty daunting. Can you discuss some of the challenges in writing about beer – flavors, sensations, etc – and how you manage to convey what’s happening in your mouth so adeptly? Well, with The Brewmaster’s Table, I worked on developing a very specific voice. On the one hand, I was a polemicist, but on the other I didn’t bother writing about craft beers I didn’t like – I wanted to expose readers to good things I enjoyed drinking. Beyond that, beer or tasting notes tend to be really boring things to read, so I intentionally wrote in a very active voice. Think about it like you’re describing or recapping a sports play, like baseball. First, a guy ran to first, then he jumped there, rounded the base, and then headed for home. That’s very much what flavor is like. It’s not a flat, linear experience. First, you hear the bottle open, then you see the beer, then you smell it, and finally you taste it. All of that takes time and your experience changes during that time. Writing about beers and flavors of beer in that way gave some life to the book. I also think it was important for me to write about the beer as a person and not a machine. If a beer reminded me of something or called up a memory, I decided to say what it reminded me of and how that surprised me. This keeps you from falling into a rut and makes you talk about something in a new way, even if you’ve seen it a hundred times. Your second major work, The Oxford Companion to Beer, is a whole other animal when compared to The Brewmaster’s Table. It’s more of a reference book as opposed to an exploration of beer through various narrative strains, and I’m wondering if you can talk about the differences in writing each one? My big worry for writing Oxford was that the writing would be dead on the page, and if I was going to do something of a reference book, I didn’t want the writing to die on the page. So I decided to rewrite every single entry in the book, even if they were things I didn’t write. There were some contributors who brought real life to their entries, but most people don’t naturally breathe life into the copy. My favorite example was a great article on something called “stuck mash” – you’re at the brewery doing your mash, running liquid through it, and the mash compacts and turns into this sludge and stops the brewing process. The original entry was very technical – kind of like describing when your radiator springs a leak and you’re left on the side of the road. But that doesn’t really bring the human element to one of the most frustrating things you can imagine for a brewer. Everything goes fine, something you’ve done a hundred times, and then suddenly it turns on you and it really ruins your day. That’s why I think Oxford really made me a writer. With that book, I was writing for a very different kind of audience, a much broader audience, from sommeliers, to beer geeks, to brewers, to someone with a passing interest in beer and who got the book for a Christmas gift. Plus, there was the whole idea of cataloging – with The Brewmaster’s Table, the facts had to be true, of course, but anything associated with Oxford is like the word of God, so things had to be checked so many times to ensure accuracy. It was a very different experience. What are some of the seminal craft beer books – or books about food, wine, spirits, etc – that you return to for inspiration or the pure enjoyment of revisiting them? W.L. Tizzard’s Theory and Practice of Brewing Illustrated. I actually have an early edition of that book. He writes so bombastically. You can open any page in that book and start reading and the intensity of the language is beautiful. Hell, he actually goes so far as to castigate people by name for their lack of brewing or beer knowledge. He’s just on fire throughout the whole book and it’s a technical book. Jancis Robinson’s The Oxford Companion to Wine gave me that stately Oxford voice and style for the Oxford Companion to Beer, but managed to put light and humor into the text at the same time. Her book sat at my feet for four and a half years – whenever I sat down to write, I would think, ‘What would Jancis do?’ That was the standard. And I have to again mention the great beer writing of Michael Jackson for the great humanity of his writing. In the Oxford book, I refer to him as the most important voice in food and drink in the 20th Century, even though he may not be known by name to the average person. But it’s kind of like someone told you they saw The Clash in New York in the 1970s and there were only 50 people in audience, but every one of those 50 people went out right after seeing that show and started a band. With two major volumes of work to your name – not to mention numerous articles and essays in beer and beverage publications across the country – what about beer keeps calling you back as a subject of investigation and scholarship as opposed to something you make? The story of craft beer and brewers in the U.S. is a story of diversion; it’s a story not unlike America itself. We – brewers, passionate craft beer drinkers – all had other lives before discovering beer. We went to school to get the degree to get the money to get the house to have the stuff people say you should have. But then you suddenly fall in love with this thing and this thing is beer…and it makes you poor. And it makes you throw out everything you became – your degree in law, medicine, film – whatever you thought you were going to be because you love it. Michael Jackson was really the last one who wrote about what beer was actually about: the stories of people. If you listen to these stories, they’ll tell you what you really want to know about, and that’s people. Lastly, given that you’re widely regarded as the master of beer pairings, we couldn’t let you get away without asking for a handful of personal pairing recommendations, the first being your favorite beer with your favorite book? What a great question. Man, that’s one I’d have to think about. Books aside for a moment, we’ve done some really fun things in the past pairing beers and films – things like strong IPAs with on-screen moments of bitterness, or Brettanomyces beers with on-screen moments of funkiness. But with books? Maybe a certain type of dark, English old ale with one of the Lord of the Rings books? [laughs]. With the holiday season in full-swing, what about a great holiday food pairing? Tripels, malty barleywines, and imperial stouts immediately come to mind, especially with cheese. A big imperial stout with some stilton is a sure-fire hit on the table. I’m a big fan of French bière de gardes with holiday dishes, and I think my love for saisons is pretty well-established. But whenever I’m doing a holiday dinner, there’s going to be a bit everything. Beers for some things, wines for other things, and I always encourage people not to choose one or the other. Most of the time, at my house, guests are going to have both, and maybe a cocktail thrown in there as well. Finally, knowing you’re something of a music guy, imagine you’re kicking back in your living room after a long day and you want to put on a record. What beer are you pairing with it? For the music, LCD Soundsystem or Hot Chip. For the beer, if I’m not doing Brooklyn’s Sorachi Ace, it’s Saison Dupont. Many thanks to Garrett Oliver for taking the time to sit down with us and chat about beer, books, and everything in between. For more information about Brooklyn Brewery, click here. Nick Ostdick is a husband, runner, writer, and craft beer enthusiast based in Western Illinois. He holds a MFA in creative writing from Southern Illinois University and has worked as a college instructor, journalist, and blogger.